In today’s “everything digital” world, protecting your valuable business information can be challenging. Firewalls, antivirus programs, filters, security appliances, intrusion detection monitors and more all play a role. Yet still, even with all these technological deterrents, none are 100% effective. The bad guys can still sometimes get into your network and do evil. You need look no farther than the current “CryptoLocker” virus to get a feel for the economic threats all businesses face. Our clients depend on us to be there when things go wrong. We are committed to safeguarding copies of your mission critical data on our servers – and we take digital security very seriously. 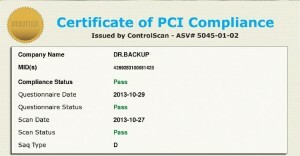 – 100% of the user data on Dr.Backup production servers is strongly encrypted. Even if the bad guys can somehow get into the network (or steal our servers from the data center,) your secure information would be useless to the perpetrators. – We use a commercial-grade firewall service with strong authentication control rules. Every attempt is made to prevent/deter unauthorized access to our network. We work closely with our internet service provider to block and then investigate intrusion attempts. – There are no public facing web servers on our production backup network. Web server security vulnerabilities are commonplace and make a network inherently less secure. – Our back office systems encrypt and password protect your credit card information. 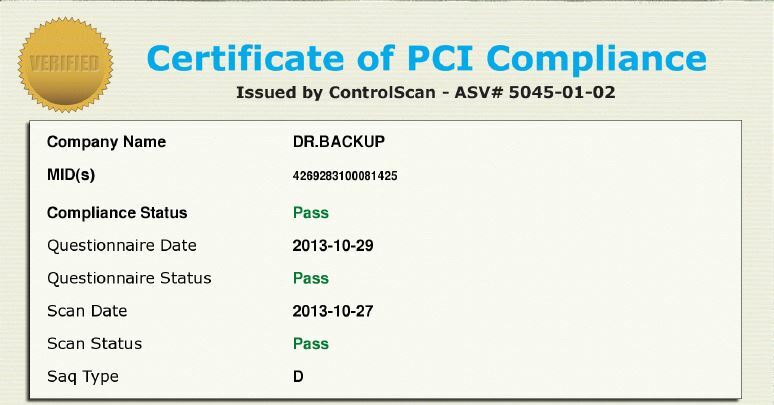 We regularly audit our in-house systems and successfully complete independent PCI external scan audits each quarter. Remember, file synchronization and replication programs fill a valuable role in a collaborative workplace – but that role is NOT as a fail-safe, secure, offsite backup service for mission critical data. Don’t be the corporate “hero” that skimped on offsite backup service to save their business $1 or $2 a day. There is a right way to do online backup.